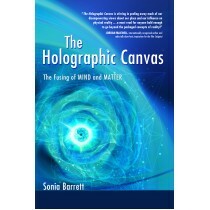 The Holographic Canvas explores many possibilities one of which raises the question "is Earth as we know it but a matrix or system of programs? Is death then a necessary process or is it simply part of the matrix program? Is it then possible that the concept of dying will cease to exist once humanity uncovers the deception?" Sonia Barrett proposes that human bodies are vehicles not yet turned on but designed to make molecular modifications according to the vibration of our consciousness. She takes us on a journey of our existence in a holographic world, as she states "a virtual game; an assortment of illusions strung together by the brain and the mind. It's an exploration of the illusion of a solid world generated by fluid movements against a canvas of energy, all of which is taking place against the backdrop of the void." Barrett concludes that the answers are all tied into the forgotten past and like the single cell of a plant our history is encoded in our cells, DNA and the air we breathe.